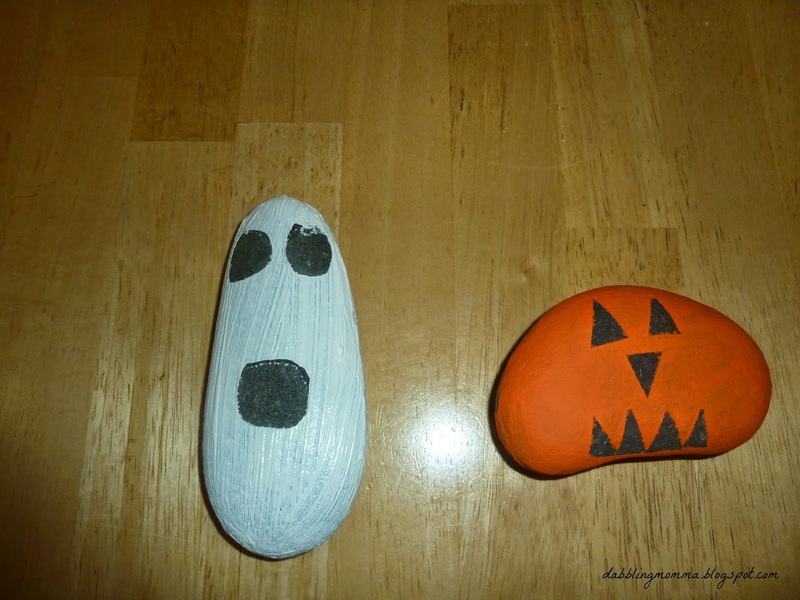 Painting with rocks is certainly not new to us as my daughter really enjoys painting with them. We had alot of fun with our Creating with Rocks and with our Princess Rocks. Who knew that the rocks my husband and I once used to accent our gardens would one day turn into craft projects with our kids! 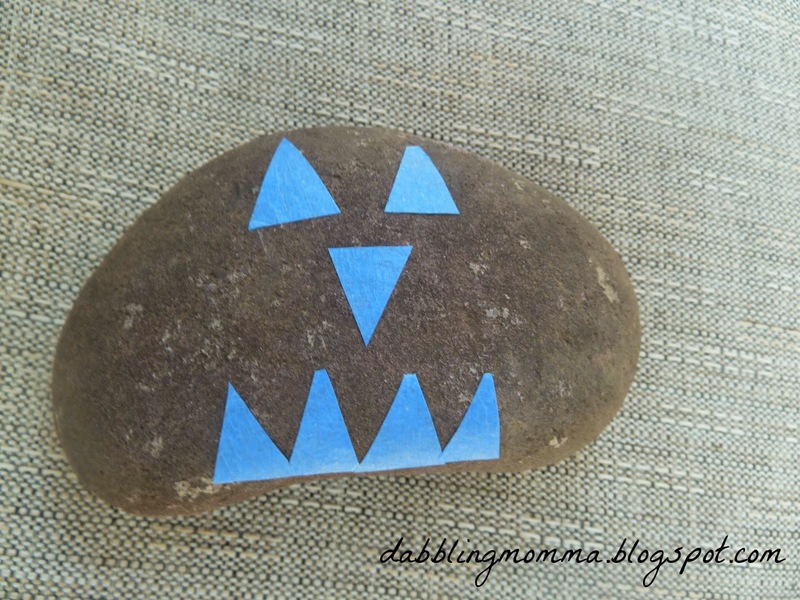 To do the tape resist art simply take some painters tape and make the face that you want on the rock. Once that's done, hand the paint brush over to the kids and let them paint away! Once completely dry carefully peel off the tape. We only did the tape resist with our pumpkin and ghost. 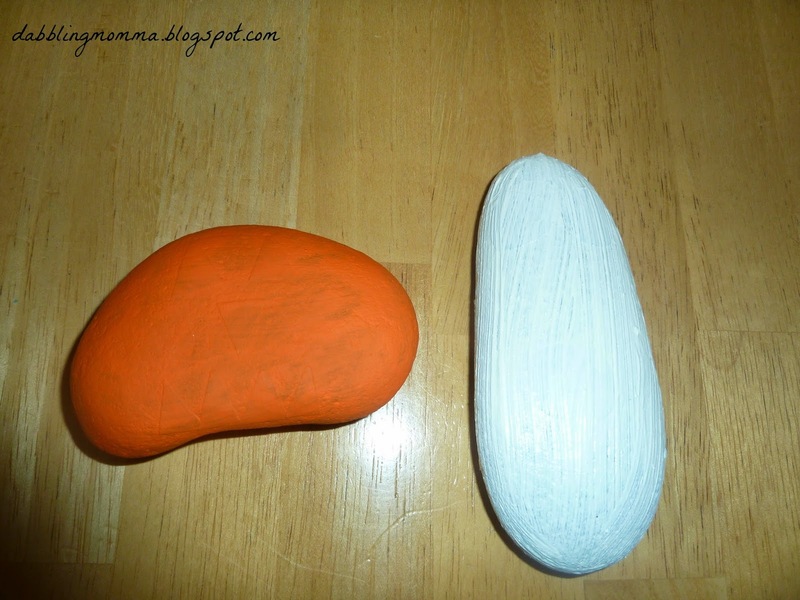 For the candy corn we simply painted the rock with candy corn colors! It's not shown here but I also added a stick to act as the stem for our pumpkin rock. For the acorns we just painted them orange for the pumpkins, white for ghosts and added faces with permanent marker. After our rocks and acorns were painted I knew I wanted to display them outdoors but since I wasn't going to put any protective coating to keep the rain from washing them clean I had to think of somewhere else. Since most of our Fall and Halloween decorations are on our front porch we added our Halloween rock garden here too. The porch would also keep the rocks safe from rain, etc. I didn't want to just lay the rocks flat or prop them up so I thought since this is a 'garden' of rocks why not use black beans to act as the dirt and get a container to put them in. I purchased an orange bin from The Dollar Store, added the black beans and put everything inside. 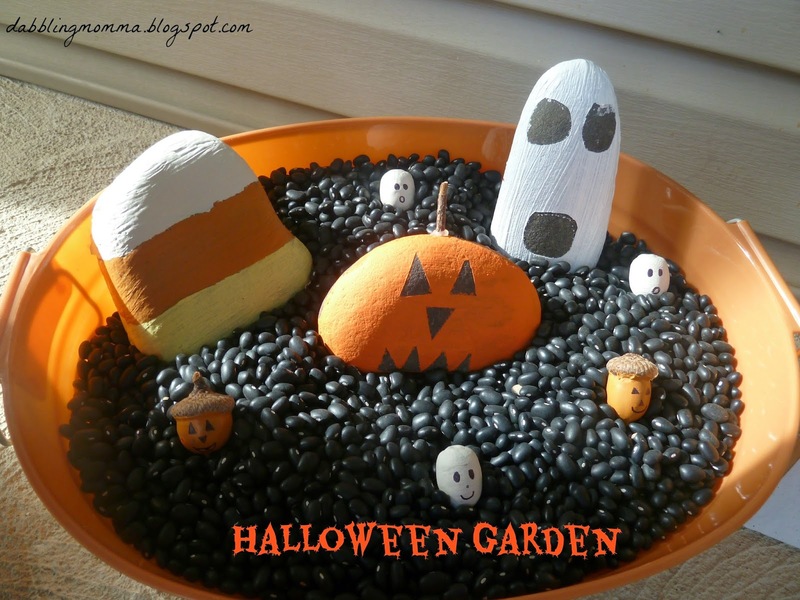 This Halloween Garden adds to our Halloween and Fall decorations but what I really like is that once we are finished with the holiday I can re-use the beans for a sensory or other activity and the rocks can be repainted after I let the rains get to them. As for the orange bin I will keep that for future Halloween decorating or I can use it for future Halloween's to hold the treats for trick or treaters! What a great idea! We had great fun in the summer making miniature gardens so this is definitely the kind of activity my kids would enjoy. Hi Nicola! Miniature gardens sound fun, too!! Thanks for stopping by! This is SOOOOOO cute! Glad you reached out, I'm happy I discovered your blog! I love this and I think we will have to make a Halloween garden of our own! I'll also be following on Pinterest! :) Are you on Twitter? Hi Jessica! I'm glad you like our Halloween garden! There are so many other things you could 'plant' in your garden, lol!! I'm not on Twitter just FB, G+ and Pinterest. Thanks for following along and stopping by!! We had fun with it, April! Thanks so much for taking the time to comment and for pinning!! Oh my goodness! Is this ever fun... and brilliant! Thanks Laura! There are so many other things you could 'grow' in your garden too!! What a great idea!!! I love this. Thanks Nichole, glad you liked it! really cute craft i must say! Thank you Otilia, appreciate that!! This looks so much fun, it's going on my to-do list for this month! Hi Grace! I hope you get a chance to make your own Halloween garden, it was a ton of fun!! Love it! So stinking cute! Def going to give this a try! Found you via Thoughtful Spot link up! Thanks for stopping by Melissa, I appreciate the comment! Have fun with it, we did!! Aww, how cute!! What a nice idea for a Halloween decoration- gonna have to make this with my kids! Thanks, Randi! I hope your kids have fun making it!! Let me know how it turns out! Susen, I love these! Thanks for stopping by Facebook today, pinning and sharing. Thanks so much Heather!! We had fun making it!! This is such a fantastic idea. My kids are big rock lovers. Pinned it. Hello from Serenity Saturday. Hi Melissa and thanks for stopping by! I'm glad you like our rock garden. It was so much fun to make and now to display! Thank you, Mum of One! I hope you and your son have a blast with it!! That's a great idea! 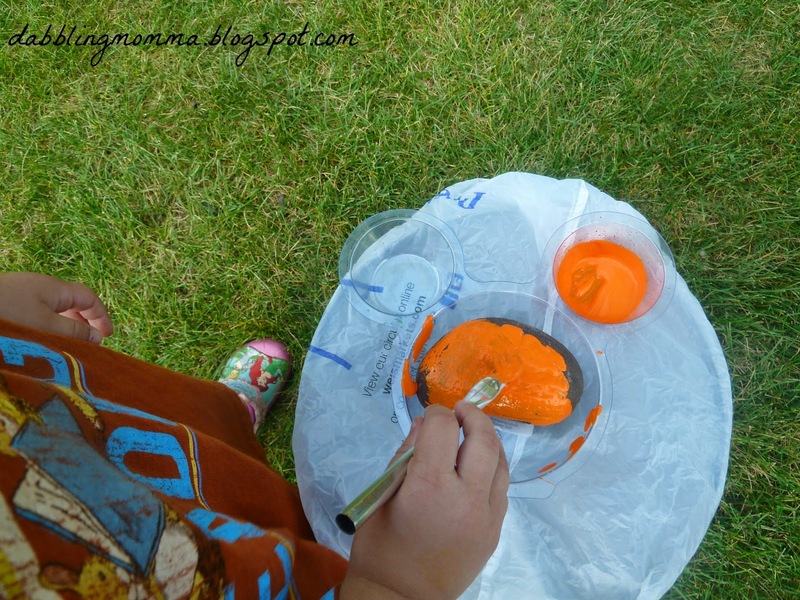 The kids could help paint and show their creativity. Thanks for linking up to Show Me Saturday! I hope to see you there this week. Oh, how fun!! I love it! Thank you for sharing at Sharing Saturday and congratulations on being most clicked this week! What a simple and great idea. Thank you for linking up with The Kids Co-op - I am featuring on this weeks. I'm so glad you liked it! Thanks for the feature! This is super cute! Saw this in The Pin Junkie's 2yr Blogiversary link party. Thanks for sharing it! Thank you Alyssa, appreciate the comment! Congratulations! This post is featured over at Diana Rambles today (from last week's Pin Junkie Blogiversary Link Party) and has been pinned in the Featured at Diana Rambles board at Pinterest, Tweeted, and Recommended on G+. Please grab a featured button off my sidebar or via the link under the features. Thanks for sharing this awesome idea! Hi Diana! That's great news, thank you for featuring our post! !